When we were still in Nepal and advancing on the Indian border the density of the people and the traffic already increased noticeably. 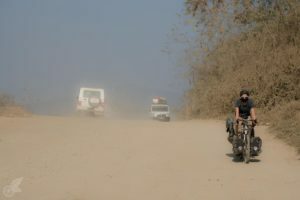 Our first time in India two months earlier had been indeed very interesting and often thrilling, but as well extremely exhausting – because of that we were not exactly optimistic about our second time here. 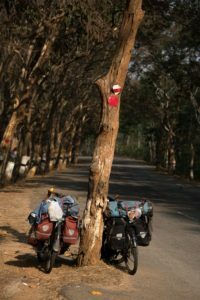 Especially the peace and fewer people around us had been something we enjoyed a lot in Nepal and now we were dreading the countless people we would encounter at the roadside in India, all seemingly just waiting for us to pass by and to observe our every move. 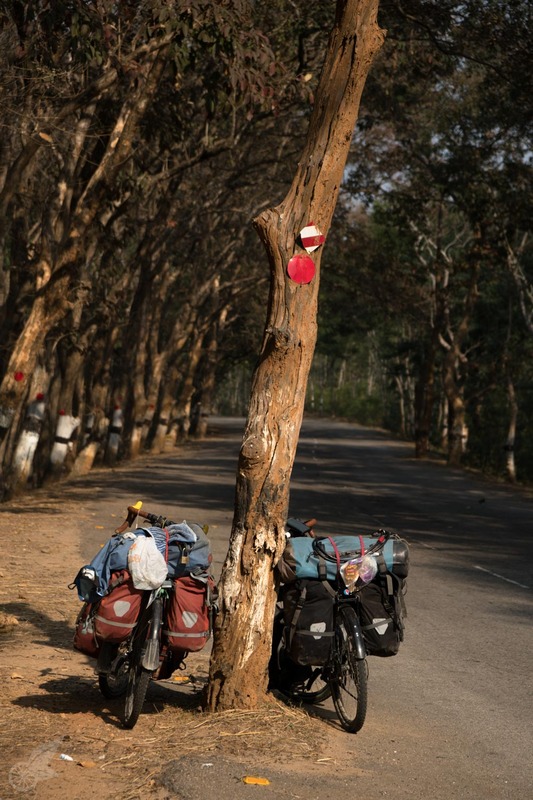 Now we are in Imphal, the last city in Northeastern India where we are resting before cycling another two days to cross the border into Myanmar. Currently there is a general strike happening in the whole state of Manipur because the local people protest against some new legislation by the central government and because of that all shops are closed. This means it was quite difficult to find even some fruits and vegetables and the otherwise probably very lively market place was dark and empty. We walked through anyways and indeed in middle of it we found a few women who seemed to have been left behind and we could at least buy some bananas and potatoes for our journey onwards. Another wandering man knew a little bit of English and we could have a basic conversation and had fun taking some silly pictures with the women. During the last three weeks in India we have had many similar encounters. Aside from the sometimes beautiful landscape and idyllic villages these were essential to our journey. In Siliguri, Guwahati and now in Imphal we had the chance to stay with different people whom we had contacted through Warmshowers or Couchsurfing. It is striking how these three places also seemed to resemble three very different aspects of Indian society and life. In Siliguri we were hosted by very friendly Partha who lives alone in a little apartment and is a freelance web developer. He has set up his life exactly to his needs and in contrast to most of those around him he is happy on his own and does not aim to start a family. Our next stop was in Guwahati and there we were hosted by Irani and her family. They own a big house and seem to be a part of the Indian middle class. It was very nice to share meals and conversations with them, to have the opportunity to visit a wedding and to feel like we were becoming part of their family for a little while. Finally we have spent two days in Imphal with Binay’s family who live in basic conditions without running water and only unreliable electricity. Also here we experienced warm hospitality. Thank you to all for welcoming us into your homes and letting us be a part of your lives for a few days! During cycling we had also many spontaneous encounters with people. 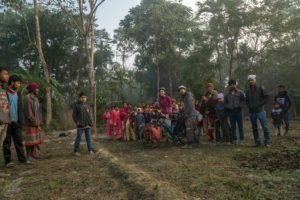 At first we had been cycling through rather densely populated areas in West Bengal and Assam and often had troubles to find a decent camp spot among all the little villages and fields. 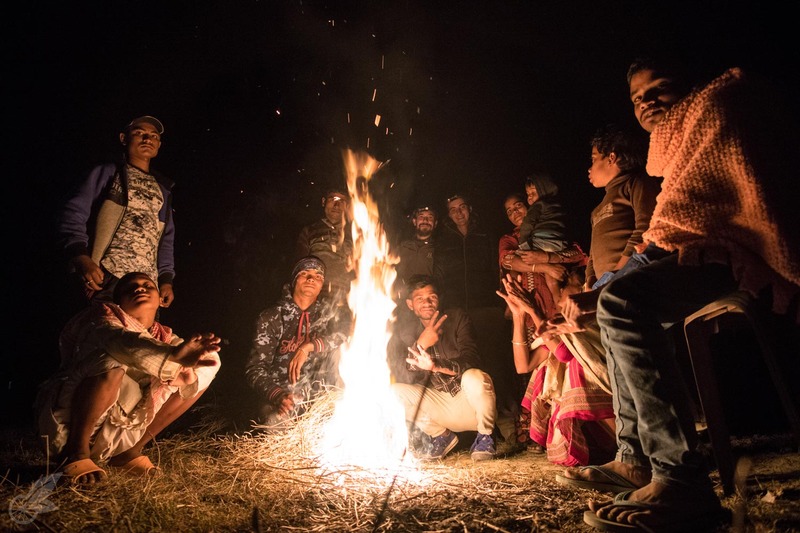 Because of that we asked farmers, trying to communicate with our hands and feet sometimes, and they happily let us set up camp next to their houses or on their fields. On most of these evenings a crowd of twenty or thirty people gathered and curiously watched what we were doing and were fascinated by our equipment. One code of behaviour (mostly enforced by women) became evident which we found funny: we were not to be disturbed while eating. As soon as one of us would have a first bite everybody would retreat and watch us from a distance of around 50 metres. Nobody wanted to miss out in case we finished our meal and did something interesting again. To be honest I was quite happy to not be a famous star because at least we knew that we would soon enjoy some privacy again. However not all encounters were funny or positive. Especially motor cyclists on the road often were a nuisance because many insisted on having a chat with us while driving closely to us despite the heavy traffic and bad road conditions. Most of them asked for a selfie with us which we almost always decline. Often we had the impression that they were not interested in genuine encounters with us but rather wanted to have a photo that they could show off later. One evening we were camping further away from villages on a field and hoped to not have many visitors. Unfortunately we were not well hidden and a constant stream of people was passing by. When it was already dark four young men showed up and were hanging around our spot. They hardly spoke English and after a while three of them left. The last one suddenly demanded Sami’s smartphone. Sami looked up at him confused and declined. I was getting a rather negative vibe from the young men and decided it was time to draw a line. I stood up and clearly communicated that he has to leave now before I loose my patience and hurt him. Only when he ran away Sami understood that this guy was probably trying to rob us. We were a bit amused by his clumsy attempt and to see him realise that he had miscalculated and that we were quite a bit taller than him and not at all intimidated. The nature slowly changed and turned hilly. Especially the state of Nagaland is covered by hills and mountains and to our surprise almost all the people living there are Christian. Everywhere we passed Baptist churches and communities. During the last few days before reaching Imphal we often found shelter in these communities. We are thinking back to the beginning and to the border of Nepal and India and we realise that we are indeed pretty surprised. Surprised, because even though some of our prejudices and anxieties turned out to be true in some cases we still enjoyed the encounters and had a wonderful time with the people.